Author and Quivira Coalition co-founder Courtney White to bring a ‘different perspective’ to Kansas. Ranchers Gail Fuller and Dale Strickler also to present. At first glance, Courtney White might not seem like the ideal candidate to address the Kansas Graziers Association during their annual winter conference in January. He grew up in the city where the only agriculture was the occasional family garden, and the only wildlife were the neighborhood cats and dogs. His only interaction with livestock was with the horses his family owned for trail-riding. He was a hard-driving activist for the Sierra Club, lobbying for new wilderness areas, protesting clear-cut logging in national forests and writing handbooks that were used by grassroots organizations to oppose hard-rock mining. As an activist, agriculture and livestock were barely on his radar, and when they were it wasn’t in a positive light. But people change, and times change, and divisive wars eventually take their toll leaving only the wounded and the coppery taste of defeat. Even worse was the negative energy being expended. It was like a toxic cloud sucking the life out of everything it touched. Dispirited and not a little jaded, White was increasingly aware of the hopelessness of the struggle. Just when it seemed that neither side was capable of listening to the other without threats of lawsuits or personal violence, he met a free-thinking rancher who had reached out to the environmentalists as equals. The meeting set White on the path to becoming a rancher himself, wading into the middle of the grazing wars and co-founding the Quivira Coalition, a Santa Fe-based based non-profit organization devoted to finding a “third position.” They called it the New Ranch, where people interested in innovative ideas and fruitful dialogue could meet, discuss, and learn. His latest book, Two Percent Solutions for the Planet, expands his unique outlook from the American West to a global vision for simple, low-cost solutions for environmental regeneration. Having experienced both sides of the environmental debate gives him a perspective that allows him to reach consensus among conservationists and ranchers alike. “Grass, Soil, and Hope,” the theme for the Kansas Graziers Association Winter Conference in Salina, on Saturday, Jan. 16., expands on White’s experiences in the Southwest and, more recently, around the world, to the Midwest. The lessons he and others have learned are applicable everywhere on the planet within specific or generalized ecosystems, he said, and for the most part require reasonably cost-effective and simple solutions. While writing the book, White began to look at a wider variety of farming that he didn’t know much about, from holistic grazing, edible backyard forests, biochar, weed-eating livestock, food co-ops, bio-energy and rainwater harvesting to animal power, bees, bears, wildlife corridors and a wide variety of other regenerative practices that have been field-tested and proven to be practical and profitable. Other guest speakers will be Gail Fuller and Dale Strickler. Fuller, of Fuller Farms near Emporia, began experimenting with no-till farming during the early 1980s, and has since gone on to practice holistic management techniques for his operation. His presentation, “Soil Health: Makes Dollar$ and Sense,” will center on why soil regeneration should be a priority for everyone and which management techniques have been proven successful on his farm. Soil health, Fuller believes, equates to farm health. Without soil regeneration, the future of farming is at risk. 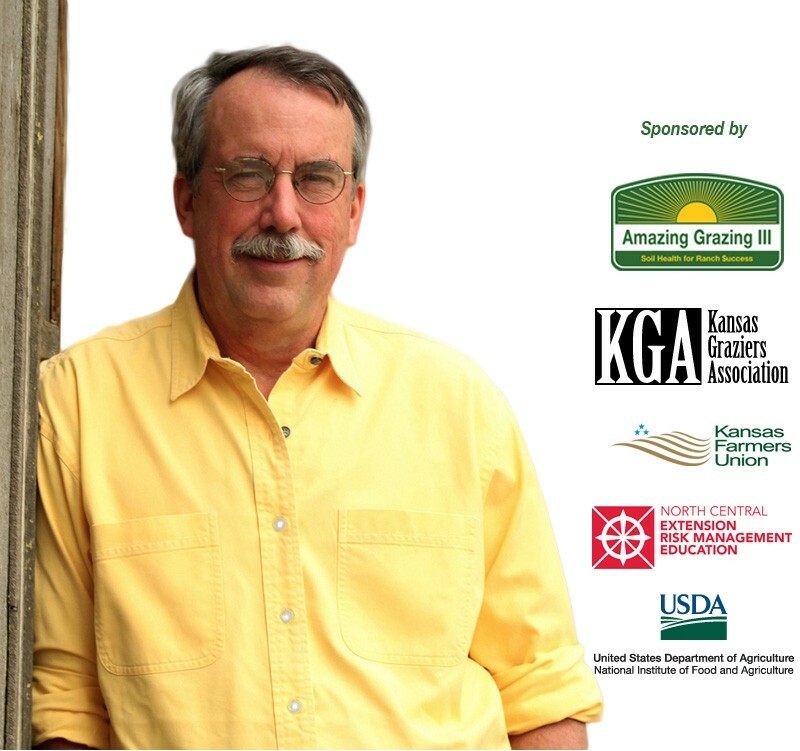 Together, the three speakers will provide dynamic information that Kansas Graziers can implement to increase grazing performance as well as improve the environment. The Kansas Graziers Association Winter Conference in Salina, sponsored by Amazing Grazing III, opens at 8:30 a.m. on Saturday, Jan. 16 at the Salina Ambassador Hotel, 1616 W. Crawford, Salina. Registration can be made online at kansasfarmersunion.com/events or by contacting Mary Howell at 785-562-8726 or by e-mail at kfu.mary@gmail.com. The cost of the single-day event is $50 for the first person, $25 for spouses and $15 for students.